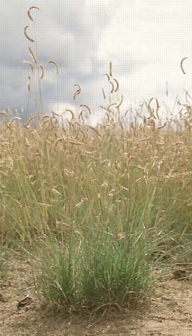 The official state grass of both Colorado and New Mexico is Blue Grama Grass. It is very drought tolerant, and is native to much of the mid-section of North America, roughly from the Mississippi River to the Rocky Mountains. It is commonly used in ornamental landscaping, and sometimes even in flower arrangements. As with many prairie natives, what it lacks in height above ground, it more than makes up for below ground: Although BGG can grow up to two feet high in wetter climate zones, in drier regions, such as Colorado and New Mexico, typical heights of BGG are around 8 or 9 inches, but root depth can be from 3 to 6 feet! Warning – Skip this next part if you don’t like lame jokes: Take the length of the whole plant, and you could have the height of a legitimate NBA player. No information exists on the ability of blue grama grass to either post up, or shoot from the perimeter. This entry was posted in Uncategorized and tagged blue grama grass, colorado, New Mexico, state grass, state grasses. Bookmark the permalink. But the real question is, considering the negative effects of drought and environmental disruption…can it rebound?